Suceava (IPA: [su. 'ʧa.va]) is a county (judeţ) of Romania in the historical regions Moldavia and Bukovina. The capital of Suceava County is Suceava. 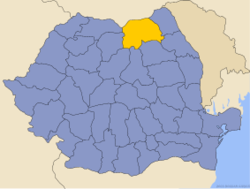 Suceava County has an area of 8,553 km². The west side of the county has many mountains from the Eastern Carpathians group. These are the Rodna Mountains, the Rarău Mountains, the Giumalău Mountains and the three "Obcine". The county is lower in the east, with the lowest point in the Siret River valley. The county contains the Siret River and some of its tributaries. This means that they run into the Siret River. These tributaries are the Moldova River, the Suceava River and the Bistriţa River. Botoşani County and Iaşi County to the east. Maramureş County and Bistriţa-Năsăud County to the west. Mureş County, Harghita County and Neamţ County to the south. Suceava County has 5 municipalities, 11 towns and 98 communes. In 2002, it had a population of 688,435. The population density was 80.5/km². These are the nationalities of the people who live in Suceava County. This is how the population of Suceava County has changed over the last 60 years. Wood industry – the county has the most surface covered with forests in Romania. There are also metals that are mined in the mountains. Wikimedia Commons has media related to Suceava County. This page was last changed on 10 August 2014, at 23:26.